Two of western Canada’s leading learning institutions are creating an innovative approach to community-based research: the Glenbow Western Research Centre at the University of Calgary. Over the next two years, Glenbow’s Library and Archives will be relocated to the University of Calgary to provide the widest possible access to this remarkable collection. This move to the university, for a 99-year period, closely aligns Glenbow’s collections with teaching and learning, and research interests at UCalgary. 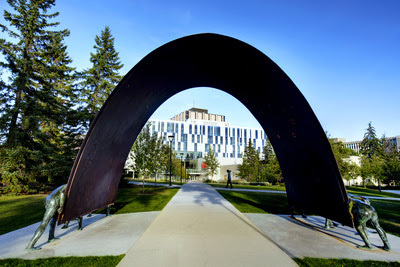 The relocation gives students easy access to another world-class collection and will benefit students in a wide range of disciplines including: local, regional and provincial history; social studies; cultural and social history; religious studies; geography; political science; military history and artifacts; and agriculture. The collections include provincially owned archives currently held by Glenbow and stewarded in accordance with existing standards that Glenbow is responsible for providing under the Glenbow-Alberta Institute Act and its service agreement with the Province. The Province of Alberta has approved the relocation agreement. The addition of the Glenbow collections to the University of Calgary is made possible through the generous support of the Calgary community. Bill Siebens and family are providing support integral to the relocation. Other donors, passionate about preserving Western Canadian history and culture, may contribute to support the relocation of the collections to the university and their ongoing stewardship. The Glenbow Western Research Centre will be located in the Taylor Family Digital Library and the collections will be stewarded by experts in UCalgary’s Libraries and Cultural Resources. The transition will take place over the next two years, beginning in January 2019, with the new location expected to open in the fall of 2019. Details on the relocation will be available atucalgary.ca/glenbow to ensure smooth transition and clear access to materials. The Siebens family contribution is part of the university’s ongoing fundraising campaign, Energize: The Campaign for Eyes High. The campaign is currently at $1.126 billion towards its overall goal of $1.3 billion. Energize: The Campaign for Eyes High is the University of Calgary’s most ambitious fundraising campaign in its history. Funds raised through the campaign will support student experiences, research outcomes and community connections. Together we are fueling transformational change for the University of Calgary, our city, and beyond — inspiring discovery, creativity and innovation for generations to come. Formally launched in April 2016, the campaign is more than two thirds to its overall goal of $1.3 billion. ICAP is a national network and registered charity that promotes a systematic, national strategy to secure the Italian-Canadian contribution to Canada's narrative, past and present. Disclaimer: ICAP depends on its members, volunteers and collaborators to support its mandate.